Christmas is arguably one of the most celebrated holidays and [with horrific weather forecasts in the North East of the United States] I've spent most of it reflecting, planning and best yet...finally learning to play a musical instrument. 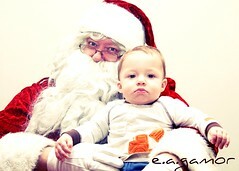 This picture was taken at a kids Christmas party at church, the baby seemed unimpressed by Santa and his prodding. With the ups and downs of 2010 he mirrored my sentiments exactly: "Let's get on with it shall we?" 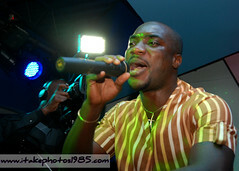 My man Kwabena Kwabena finally performed in the States. 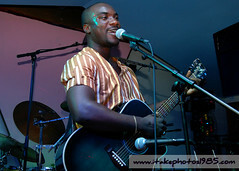 For those who aren't familiar with him yet, you've probably heard his songs: "Aso" with Kontihene, "Do no bi" which was the soundtrack for Shirley Frimpong-Manso's "Perfect Picture"
One of the things I like about Kwabena Kwabena, I had an opportunity to interview him on a radio show (Drive Time with Komla); is that he is humble, talented and a pleasant person to speak with. 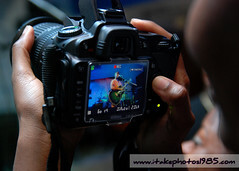 What I didn't like though, as has become the constant with Ghanaians promoting artists abroad is, was the event venue and set-up. A live band, MTV-unplugged-atmosphere would have been way more ideal than a DJ set-up. 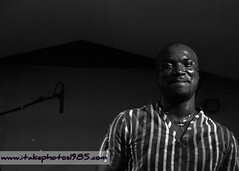 More grease to Kwabena Kwabena's elbows, if you love Ghanaian music and haven't heard of him/his songs, you definitely will soon enough.